Alesis present Strike, their new series of electronic drumkits. Alesis has presented Strike, a series of electronic drum kits that look more realistic than ever. Simmons Drums introduces a new affordable electronic drum kit, the SD500, available for under $500. Alesis completes its electronic drum line and introduces at NAMM the DM7X Kit and iPad-integrated DM Dock Pro Kit. Roland announces the TD-4KP V-Drums Portable, an electronic drum set with a folding design. Toontrack’s European distributor Time+Space has teamed up with Roland to give you the chance to win a virtual drumming bundle. 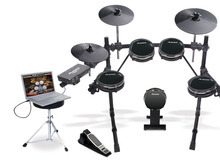 Yamaha is showing its DTX530K and DTX560K electronic drum kits at this year's Musikmesse. Roland is upgrading their entry level V-Compact electronic drum kit series.